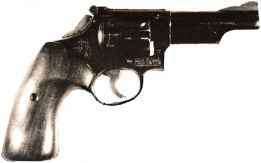 Pet revolver is S & W Magnum, "dehorned" and with trigger guard slimmed for fast double action use. Big grip helps to control handgun's kick, yet is not bulky. machine and reflex time works against him. Drawing for one reporter against a Crocker timer, he registered the fastest time ever recorded on that machine. On Art Baker's TV show, "You Asked for It," in January 1956, he drew and scored a hit on a "Drawmeter" timer in .3 (three-tenths) of a second. His latest accomplishment is a record time of .27 (twenty-seven hundredths) of a second to draw and score a hit at 15 feet on the Ross Robot Dueller, including reflex time. 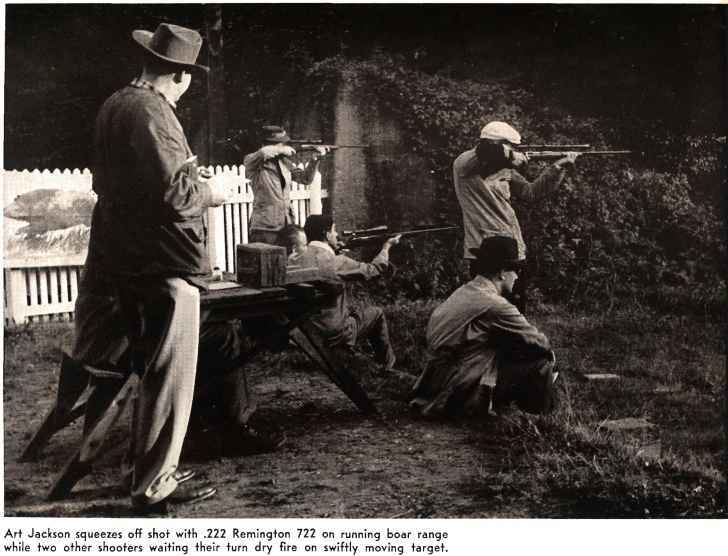 The "record" for a fast draw is a fluid thing because of variations in the conditions of the draw: whether reaction or reflex time is counted, whether a hit must be scored or not, and how the timing mechanism works. None of Jordan's draw times described above have been beaten on the same machines and under the same conditions. Is he the fastest man on the draw ? He has never claimed to be and doesn't really care, but he doesn't want ever to be second best in a real gunfight. "Well, Bill," I kept probing, "who is the fastest gun in the West?" "Aw," he stretched and yawned, "I've seen at least five of them. All you need to do is yell 'go fer yore hardware' and they come running. There's a quick draw club in nearly every town, and nearly every club has at least one 'fastest gun.' More power to them. But don't ask me to name the fastest; I'm a peace-loving man!" Bill Jordan did not become a fast man with a gun overnight, and no one else should expect to do so. It is something to be learned slowly, surely, and safely, and it can be done that way. Unfortunately, an epidemic of firearms accidents seems to mark the path of over anxious and undertrained quick draw fans who overlook the basic principles of safe gun handling. This man would tell you to take it easy and play it safe. Cheneyville, Louisiana, where Jordan was born on February 12, 1911, is hardly the place one would pick as a breeding ground for quick draw artists. He grew up and attended high school there; then went to Louisiana State University for a year. In high school and college he played basketball, baseball, and the usual other games. He also fought for seven years in AAU boxing competition. After leaving the university, he worked nine years for the U. S. Engineer Corps, as a surveyor on hydrographic surveys along the Mississippi River between Vicksburg and New Orleans. Coke-bottle quick draw displays genuine speed with no fancy work to get gun out and shooting in minimum time. Alert but relaxed stance is feature of Jordan's draw, adapted for tall man who moves arms more than short man for speed. QNE OF THE WORST of the ^ many anti-gun laws that have threatened us in recent years— Pennsylvania's Senate Bill No. 412 —was killed, we are delighted to report, by action of the Senate Committee on Law and Order; action brought about by the prompt, vociferous, effective opposition of Pennsylvania shooters, target and GPA organizations, the NRA, and, we like to think, GUNS Magazine. For those not familiar with the history of the bill, we quote the following from The American Rifleman: "This bill was ... an outgrowth of a widespread anti-firearms campaign . . . (which) . . . drew tremendous impetus from the spoken 'editorials' of a Philadelphia radio commentator. ... It is common knowledge that one of the tenets of the Communist Party is the disarming of loyal citizens through registration of firearms. It is also now common knowledge that the radio commentator who pushed so hard for the enactment of Bill No. 412 has been identified with Communist-front organizations for at least the past I 5 years!" Pennsylvania's Senate Bill No. 412 is dead. But there are lessons here which we should not forget, nor let others forget. Laws prohibiting American citizens their Constitutional right "to own and bear firearms" not only rob us of a guaranteed civil liberty— they weaken us as a nation, and by so doing, aid the Fifth Columnists among us who are being paid to do exactly that. This does not mean that all who promote anti-gun laws are Communist agents; many are well-meaning people, misled by the worn, shoddy lies that no guns would mean no crime, no juvenile delinquency. But they would do well to consider the fact (and it is a fact) that the cause they serve is the cause also of their country's enemies. Anti-gun laws have been tried and proved useless. Anti-gun laws do not stop crime, do not curb Juvenile delinquency. They do crumble one important stone in what should be an everlasting and impregnable wall of American civil liberties; and they do strip of us what could be our last line of defense against aggression. In every European country which succumbed to aggression, anti-gun laws had paved the way, to disarm the people and leave them helpless. We say, "It can't happen here." Let's not LET it happen!—EBM, Editor.